Plastic Vertical Weave is an elliptical extrusion which can be inserted into any type of chain link fencing. Plastic slats add privacy and elegance to your chain link fence. 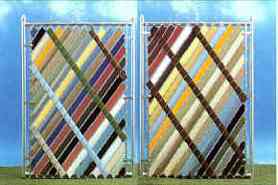 Plastic slats come in a variety of colors and sizes for a attractive way to enhance your chain link fencing. Aluminum slats are an attractive way of adding class and privacy to your chain link fence. Aluminum slats come in a variety of colors and sizes, and are rust free. With a baked on enamel finish, you will enjoy the virtually maintenance free living. 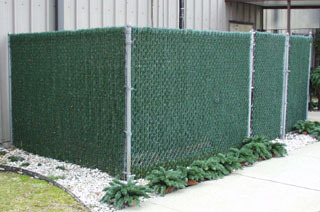 Dura Hedge is a privacy slat that gives a natural hedge look to your chain link fencing. Dura Hedge requires no maintenance, trimming, or watering. Dura Hedge Link carries a full 10 year warranty against fading and breakage under normal use. customer service representatives are willing to assist you in your order. It is important to measure the height of your fence before ordering. We have had customer order 5 foot slats but really need 6 foot. It is an inconvience to you and can be costly. Also we do offer a very simple program for $2.95 where by we will send you a sample of the color you are looking to purchase. If you order the wrong size or color of vinyl slats and wish to return them there will be a 20% restocking fee. NO EXCEPTIONS!